After 1,000 years in the Diocese of Essen, Germany, and under the custodianship by Msgr. Volker Bauer, the Arqueta encasing the Relic of the Cross of Christ finally finds its home in Monasterio de Tarlac. This came into realization after Msgr. Volker Bauer’s years of searching for a willing candidate to look after the relic. By God’s grace, he found Rev. Fr. Archie Cortez, who has founded a monastic community called Servants of the Risen Christ Monastic Community in Brgy. Lubigan, San Jose, Tarlac. The relic was enshrined in January 2007, in a baroque-inspired chapel in a 43-hectare property within the 278-hectare Tarlac Ecotourism Park, 30 kilometers from Tarlac City. 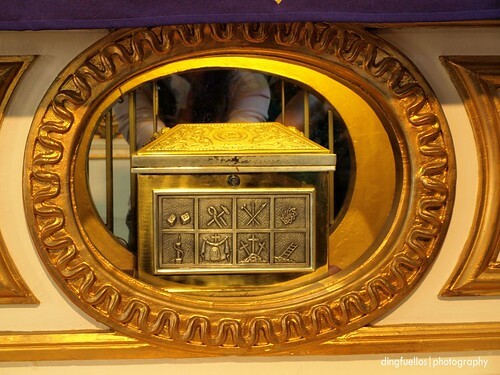 The Relic is enclosed in a silver arquetta (ark) engraved with catholic symbols of crucifixion such as a pair of dice, the garment of Christ worn during his passion, a hammer with nails, and a ladder. The relic is enshrined beneath the altar. It was authenticated by a papal seal as proof that it is, indeed, the true cross of Jesus. Pilgrims come to the Monasterio to venerate the Lord Jesus Christ and line up to touch the ark while praying for their personal intentions. Aside from the chapel where the relic is enshrined, the Monasterio features a 30-foot Risen Christ facing the valley and mountain ranges in the West. Surrounding the chapel is a scenery that pleases the eye even in drought-stricken rolling hills and mountains where the shrine is located, which is very much ideal to be with the Lord in silence. Thus, after the veneration and pilgrimage, it would also be the best time to have a picnic with the family and friends in the nearby Tarlac Ecotourism Park. 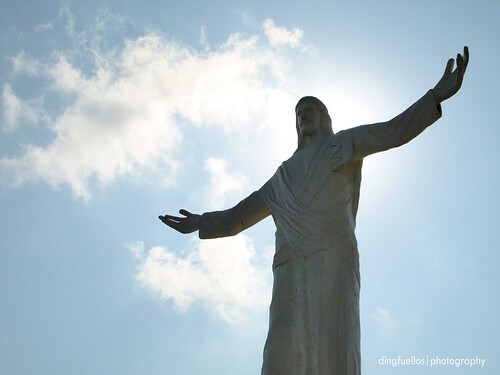 See more photos of the Monasterio de Tarlac in Flickr or Watch this slideshow. This slideshow is best viewed with a faster internet/DSL connection. For better viewing roll your mouse, click photo to enlarge.